One of the easiest recipes that can be prepared for a breakfast or lunch or dinner is a stuffed paratha. They are very filling and are a hit with my family. Paratha stuffed with Aloo curry is the easiest of stuffed parathas. Chapathi dough stuffed with spiced mashed potates (aloo) and cooked on a hot tawa with butter or ghee with simple daal or homemade curd makes an excellent breakfast, brunch and dinner in my home. Heat oil in a small frying pan and add cumin seeds allow them to crackle and remove from heat. Boil potatoes, cool, peel and mash the potatoes (You can pressure cook or microwave potatoes). Add all the ingredients for stuffing along with the fried seasoning and mix well. The mix should be dry, free of water. Otherwise, it will be difficult to roll out parathas. Keep the stuffing mixture aside. 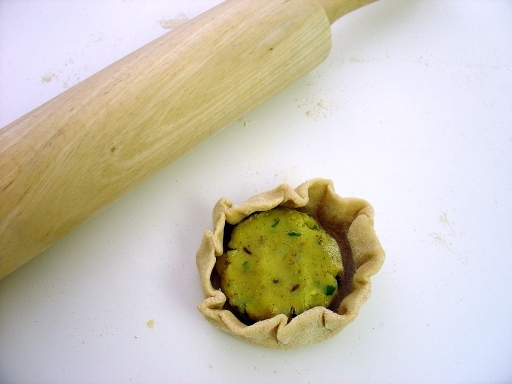 Divide the dough and stuffing into balls of equal portions, now roll one ball at a time in the form of a small puri. 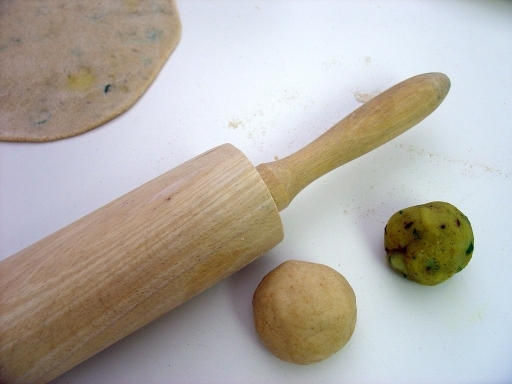 Now put a small quantity of above stuffing (potato filling) over it, close it from all sides.Gently pat the stuffed puri in the palms, apply some flour on both sides and roll it gently into a paratha.Now cook on a tava, allow one side to cook when the color changes into light brown color.Turn repeat for other side. Drizzle some butter or ghee on each side and flip. Serve hot. 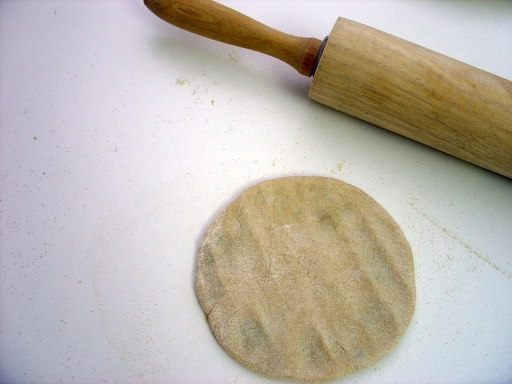 If you are new at making parathas, it is better to have firm dough, which is easier to control while rolling out. Parathas can be made in advance, cool and stackup cooked parathas on top of each other with a wax paper in between and wrapped in foil and chilled or frozen. They can be de-frosted and re-heated before serving. 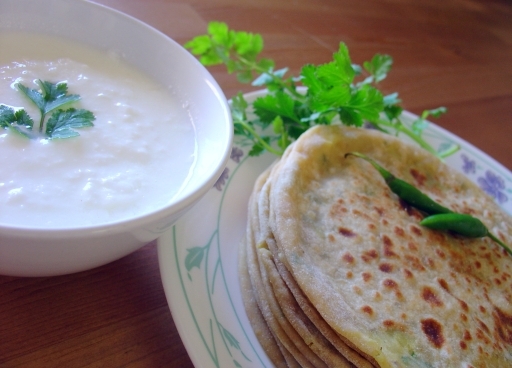 To re-heat, place 1 paratha on a hot gridle or tawa and cook until it become crisp on both sides. You can use the similar procedure with uncooked parathas also. Parathas last 2-3 months in freezer and 5-7 days in fridge. Let me know which brand atta you buy,thanks. Thanks Asha, I use Shakti bhog atta. Its really good and rotis are very soft. That picture is truly gorgeous. Those parathas look delicious. hey ur parathas look so uniform & well made! unfortunately i can’t see the picture.by reading i can say it will be tasty!!! actually here we haven’t got phone connection till now.i will call u once i got.take care of nishu. Richa stuffed paratha’s are one of our fav’s. Especially lil ones. No probs swapna, will mail u later. How is vaishu doing and how is her new school. I’m sure she is having fun.Take care. dear Shivapriya, you have presented the parathas so well that any one would get tempted. lovely pics. beautifully decorated. What a wonderful place you have here,Shiva,Thanks, leading me here!!.. Beautifully depicted parathas girl. Loved the step to step depiction and I must say every picture is so beautifully and neatly taken. Your parathas look so round and professionally made. Loved it. Thanks Sharmi, Your pictures and recipes always tempt me so much:). Dear Bharaty, I’m glad you enjoyed my virtual cooking. Very Nice step by step details & beautiful parathas, Love em!!! Love the photos! I have not yet tried making any Indian breads but these look so good and you explain everything very well! Maybe I will try making some this weekend. I will be in the states July/August although my plans aren’t complete yet. I’ll e-mail you soon, maybe we can arrange a visit! Thanks for dropping by Aruna. Sandeepa, I often freeze paratha’s they come handy when you have unexpected guest ( like my place) tava the paratha, serve with dal you are done:). Next time when you make paratha’s give it a try. Thanks Nicole. As you are good at rolling, i’m sure it will come well. Lemme know once you try it. Padmaja: I’m going to try making these today…I’m cooking the potatoes now. Wish me luck, I think I’ll need it 🙂 I’ll e-mail you when I’m finished to let you know how they turned out! Good Luck Nicole, You are an expert in rolling dough, i’m sure they will come really delicious. Hey Jeena, thanks for dropping by, I tried to click on the link u providied but its not working.. can u send me the link again..
Hi there, when ever i try to make the bread, it always comes out hard, they are not bad – but the problem is a freind of mines mother, makes the softest bread – and i much prefer when they are sort – how can i get them soft ?? i have tried about 10 times now ? 1. Try changing your wheat flour brand, I had same problem fews months back, Golden temple use to be the best, but now they are mixing lots of Maida (all purpose flour). Even other brands also doing the same. Shakti Bhog and Kohinoor are good so try any of these. Also dough should be little loose (not too stiff). Knead well and rest the dough for sometime (atleast 1/2 hr). BTW thanks for dropping by. This dough should be somewhat similar consistency to bread/pizza dough. If the dough is sticky, add little flour and knead gently until stickiness disappears, at the same time be careful not to add too much flour to make the dough dry. Usually it takes 3/4 to 1 cup of water. Mix the dough using food processor, if you have one. Good Luck. Hope this will help u.
hey your aloo paratha is also looking yummy dear:) the stuffing is generously filled in the paratha and I can see it in the paratha, that makes it very rich and tasty:) good one! this is my visit on ur site. I need a favour can i have some more types of parathas by mail i’ll be waiting for ur response. my husband and my kidoo will love to have different varieties of parathas. can i have some more paratha receipes. Nice idea and nice paratas too.Paratas r in good shape.I too like paratas.Keep going. Thankq all folks. I’m glad you guys loved it. Safa thanks for dropping by and will try to post some more soon. Nice recipe. I enjoy making aloo parathas too. What I found mentioned on some other websites that I found very helpful was to grate the boiled potatoes. This makes the mix very smooth. But your recipe looks great in and of itself so I am sure this works great too :)). Keep up the good work. very nice recepie.i liked it very much,thanks a lot. What a great site, love the pics. I am not the best cook but learning new items. And this was the best recipe for first timers. My parata’s came out prefect! i have tried many other recipes and gave up, but then I now read several recipe and try the one with the best steps and description. SO THANK YOU! It is tru the way to a mans heart is with food! Great site! They came out so delicious and so symmetrical.I emailed my mum some pics and she was so proud! I tried making as you have explained. The parathas tasted really good. Thanks. I tried making 2day aloo+carrot paratha. But i strugggled with it alot. wt i did was i sauted the boiled veggies’s with some masalas’s n tamrind juice. the mix was softer than urs, im sure(becoz it seems that ur able to make small peda from ur filling) i dont think so it would b possible from my filling…any how i started roling my paratha and the stuffing startd oozing out from the sides of paratha+there was uneven distribution of filling and uneven thickness of paratha+ i could make it round. Can u advise…..thx in advance…….have a great day. hiii.. tnx for recipe and th beautiful pics..i wud definatly try making dis now..
your aloo paratha is so delicious to look & tasty to eat.I felt it is very easy to make paratha in your receipe. good i m a aloo paratha luver always like to eat aloo items, specially aloo paratha,good keep it on. The recipe of aloo paratha was very clear and i suceeded in making these yummy parathas for my kids. They loved it. Thank u.
aloo parathas is an excellent recipe of parathas.thanks for giving such a nice description. I am going to try it out now. I’ve tried out dis recipe n u knw vat??? Tis simply Yummmy!!!!!Thanq. Thanks a lot…Can I too share my recipies n dis site? Mmmmmmm….I like this kind of bread . 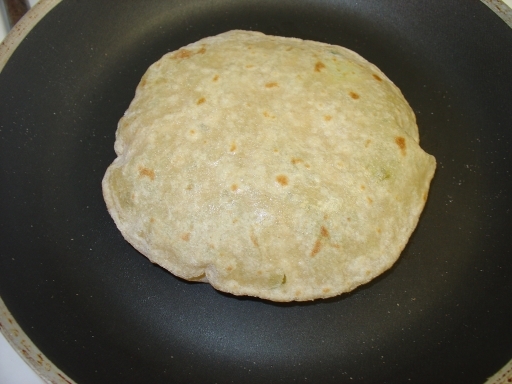 can we use maida instead of wheat flour in allu paratha? kindly reply..